The Denver Post is a daily newspaper that has been published in Denver, Colorado, United States, since 1892. The Post is the flagship newspaper of MediaNews Group Inc., founded in 1983 by William Dean Singleton and Richard Scudder. MediaNews is today one of the nation's largest newspaper chains, publisher of 61 daily newspapers and more than 120 non-daily publications in 13 states. MediaNews bought The Denver Post from the Times Mirror Co. on Dec. 1, 1987. Times Mirror had bought the paper from the heirs of founder Frederick Gilmer Bonfils in 1980. As the major newspaper in Denver, the Post ranks 12th daily and 10th Sunday of the largest-circulation newspapers in the United States. As of March 2016, it has an average weekday circulation of 1.2 million and Sunday circulation of 840,179. The Denver Post receives roughly six million monthly unique visitors generating more than 13 million page views, according to comScore. In August 1892, The Evening Post was founded by supporters of Grover Cleveland with $50,000. It was a Democratic paper used to publicize political ideals and stem the number of Colorado Democrats leaving the party. Cleveland had been nominated for president because of his reputation for honest government. However, Cleveland and eastern Democrats opposed government purchase of silver, Colorado's most important product, which made Cleveland unpopular in the state. Following the bust of silver prices in 1893, the country and Colorado went into a depression and the Evening Post suspended publication in August 1893. A new group of owners with similar political ambitions raised $100,000 and resurrected the paper in June 1894. On October 28, 1895, Harry Heye Tammen, former bartender and owner of a curio and souvenir shop, and Frederick Gilmer Bonfils, a Kansas City real estate and lottery operator, purchased the Evening Post for $12,500. Neither had newspaper experience, but they were adept at the business of promotion and finding out what people wanted to read. Through the use of sensationalism, editorialism, and "flamboyant circus journalism," a new era began for The Post. Circulation grew and eventually passed the other three daily papers combined. On November 3, 1895 the paper's name changed to Denver Evening Post. On January 1, 1901 the word "Evening" was dropped from the name and the paper became The Denver Post. Among well-known Post reporters were Gene Fowler and "sob sister" Polly Pry. Damon Runyon worked briefly for The Post in 1905–06 before gaining fame as a writer in New York. After the deaths of Tammen and Bonfils in 1924 and 1933, Helen and May Bonfils, Bonfils' daughters, became the principal owners of The Post. In 1946, The Post hired Palmer Hoyt away from the Portland Oregonian to become editor and publisher of the Post and to give the paper a new direction. With Hoyt in charge, news was reported fairly and accurately. He took editorial comment out of the stories and put it on an editorial page. He called the page The Open Forum and it continues today. In 1960 there was a takeover attempt by publishing mogul Samuel I. Newhouse. Helen Bonfils brought in her friend and lawyer Donald Seawell to save the paper. The fight led to a series of lawsuits as Post management struggled to maintain local ownership. It lasted 13 years and drained the paper financially. When Helen Bonfils died in 1972, Seawell was named president and chairman of the board. He was also head of the Denver Center for the Performing Arts (DCPA). The Center was established and financed primarily by the Frederick G. and Helen G. Bonfils foundations, with aid from city funds. The majority of the assets of the foundations came from Post stock dividends. By 1980, the paper was losing money. Critics accused Seawell of being preoccupied with building up the DCPA. Seawell sold The Post to the Times Mirror Co. of California for $95 million. Proceeds went to the Bonfils Foundation, securing the financial future of the DCPA. Times Mirror started morning publication and delivery. Circulation improved, but the paper did not perform as well as required. Times Mirror sold The Denver Post to Dean Singleton and MediaNews Group in 1987. In January 2001, MediaNews and E.W. 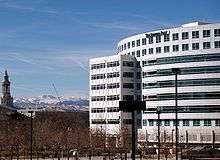 Scripps, parent company of the now defunct Rocky Mountain News, entered into a joint operating agreement (JOA), creating the Denver Newspaper Agency, which combined the business operations of the former rivals. Under the agreement, the newsrooms of the two newspapers agreed to publish separate morning editions Monday through Friday, with The Post retaining a broadsheet format and The News using a tabloid format. They published a joint broadsheet newspaper on Saturday, produced by the News staff, and a broadsheet on Sunday, produced by The Post staff. Both newspapers' editorial pages appeared in both weekend papers. The JOA ended on February 27, 2009, when the Rocky Mountain News published its last issue. 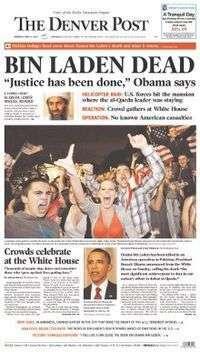 The following day, the Post published its first Saturday issue since 2001. The Post launched a staff expansion program in 2001, but declining advertising revenue led to a reduction of the newsroom staff in 2006 and 2007 through layoffs, early-retirement packages, voluntary-separation buyouts and attrition. The most recent round of announced buyouts occurred in June 2016. In 2013, just before legalization in Colorado, The Denver Post initiated an online media brand The Cannabist to cover cannabis-related issues. On September 7, 2011, John Paton – the CEO of Journal Register Company – was appointed CEO of MediaNews Group, replacing Singleton, who stayed on as The Post's publisher and CEO of MediaNews until his retirement in 2013. He remains non-executive chairman of the organization. With the move, The Post also entered into an agreement with the newly created Digital First Media, led by Paton, that would provide management services and lead the execution of the company's business strategy in conjunction with Journal Register. Paton stepped down as CEO of Digital First in June 2015, and was succeeded by longtime MediaNews executive Steve Rossi. In the same announcement, the company said that it would no longer be seeking a sale. Current columnists include Woody Paige in sports, Tom Noel on local history, Mike Rosen on the commentary page. Notable former columnists include David Harsanyi, Al Lewis, and Michael Kane. References not listed below can be found on the linked pages. 2007: Pulitzer Prize finalist in breaking news for The Denver Post's coverage of Colorado's back-to-back blizzards. 2007: Four awards for outstanding business coverage from the Society of American Business Editors and Writers (SABEW). The project-reporting winner was the Post's 2006 series on Colorado's mortgage foreclosure epidemic, "Foreclosing on the American Dream." 2007: Former Post staff writer Eric Gorski was awarded first place in "Best of the West" contest in the Business and Financial Reporting category for "The Gospel of Prosperity," a look at the finances of the Heritage Christian Center. 2007: Visual journalists at The Post won 10 awards in two international newspaper competitions - nine Awards of Excellence in the 28th annual Society of News Design judging and a bronze medal in the 15th annual Malofiej International Infographic Awards, held in Pamplona, Spain. 2007: The Denver Post won 22 top awards in two Colorado journalism contests, including the award for general excellence from the Colorado Associated Press Editors and Reporters (CAPER). The staff of denverpost.com was awarded top honors for online breaking news. 2007: The Mountain States Office of the Anti-Defamation League presented Denver Post editorial cartoonist Mike Keefe with its annual Freedom of the Press award. In February 2014, The Denver Post began publishing a section entitled "Energy and Environment," funded by Coloradans for Responsible Energy Development (CRED), a pro-natural gas group. The stories in the section are written by outsiders, not by DP reporters. A banner across the top of the section reads "This Section is Sponsored by CRED." Nevertheless, critics express concern that the section risks confusing readers about the distinction between advertising and reporting. 1 2 "AAM Total Circ for US Newspapers". Alliance for Audited Media. March 31, 2013. Retrieved June 6, 2013. ↑ Petty, Daniel (May 17, 2016). "Denver Post unique visitors jump to 6.01 million, up 65 percent year-over-year". The Denver Post. Retrieved June 30, 2016. ↑ McCartney, Laton (2008). The Teapot Dome Scandal: How Big Oil Bought the Harding White House and Tried to Steal the Country. Random House. p. 124. ISBN 9781400063161. ↑ Denver Press Club historical archive, "Archived copy". Archived from the original on 2007-10-06. Retrieved 2007-06-20. ↑ Bill Hosokawa (1976) Thunder in the Rockies, New York: Morrow. ↑ The Associated Press reprinted in Editor & Publisher (2007-06-19): "Industry Bloodbath Continues: 'Denver Post' Loses 21 Posts in Newsroom", "Archived copy". Archived from the original on 2008-05-26. Retrieved 2008-06-28. ↑ "Denver Post Cutting Staff" (June 4, 2016). 9News Denver. Retrieved 16 May 2016. ↑ New York Times (1989-12-01) "Denver Post Picks New Editor"
↑ "Denver Post Editor Resigns". Denver Post. March 15, 2016. Retrieved 16 May 2016. ↑ "Lee Ann Colacioppo named editor of The Denver Post". Denver Post. May 31, 2016. Retrieved 2 June 2016. ↑ Cavna, Michael (April 18, 2011). "THE PULITZERS: Denver's Mike Keefe wins for Editorial Cartooning". The Washington Post. ↑ "Shooting coverage wins Pulitzer". 3 News NZ. April 16, 2013. History of Denver, by Jerome C. Smiley, 1901, page 672. Voice of Empire: A Centennial Sketch of The Denver Post, by William H. Hornby, page 8.